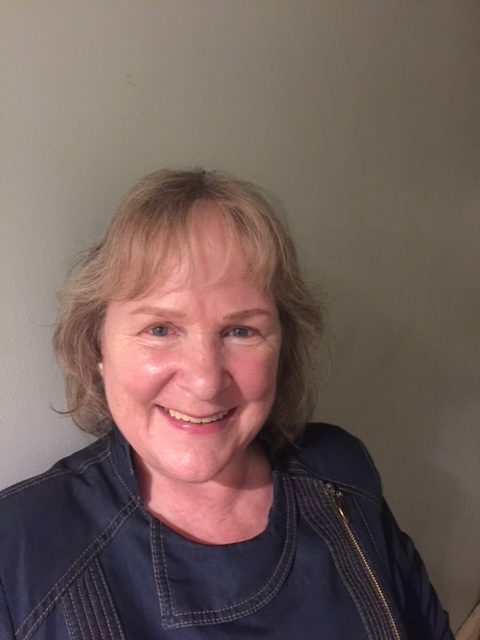 IAM delighted to introduce you all to the magnificent Joy, a fellow Divine sister I have recently met online and blogs over at spiritualmeditations, sharing her wealth of knowledge… based on her own healing journey… healing trauma, surrendering to love and living joyfully. I find it so sad that many of us have experienced so much trauma in our childhood, being brought up by people who didn’t know any better than to act out from old patterned and conditioned minds AND I feel the joy of our recovery and the wealth of new information that we are birthing from these terrible experiences and are now forging a new way of living in peace and harmony together… co-creating a new consciousness, one of unity, love and joy. Can you feel my joy, IAM dancing, singing and celebrating this new time as I meet more and more Divine brothers and sisters who are understanding the purpose of duality, sharing their own Human and Divine wisdom and holding a space for fellow awakening hearts to feel safe to dive deep within and explore their vulnerability, unfold and reveal their own truth and discover their unique part in a new dance of magnificent proportion. I know how important it is to have people around you, who unconditionally love you for being who you are… nothing more or nothing less. It gives you a most precious gift, a sacred space to be able to explore and discover who you truly are. Both Joy’s and my own husband played important roles in the beginning of our relationships and made it possible for us to unfold and flourish. A big thankyou to you both. It is Joy’s passion that drives her in practical ways to support the ones who are ready to discover their real self within… waiting patiently to guide them further on a journey of freedom and joy. You can read this blog post How can YOU find your Real Self? to gain a little flavour of Joy’s writing and to see her in action, you can connect with her through her facebook group Truly Transformational. Joy you truly are a bundle of joy, very infectious… bring it on… the world needs YOU. As a trained therapeutic counsellor, compassion for me is a word that is soaked in empathy. It includes creating a sacred space to listen without judgment and having my clients’ best interests in mind. It involves knowing that my clients already have all the wisdom and inner resources they need and my job is simply to provide the space and support for them to access it. As a human being, it is also about having a heartfelt concern for the well-being of the people I meet in everyday life and also every single person on this planet. It also includes having a heart that cares about the suffering that goes on here, whether that is my own suffering right here, right now, or someone else’s far away in some distant land somewhere. For me, it includes allowing and honouring each person’s own journey through life however that may take place and at whatever pace. It is also an acceptance of what is, as it is, since we are all, in a way simply expressions of the One Self, creating experiences for Itself according to Its desire. It is not about taking too deeply into ourselves the pain of suffering on behalf of others when we see them suffering. Otherwise, attaching to the actual or perceived pain of the tragic events and atrocities we see so often in the news and media (if we choose to watch) creates more suffering than is actually necessary. I remember when the events of 9/11 unfolded I was absolutely devastated, along with many other people around the world. It sent me into a 3-month long depression and period of chronic pain. This was because I attached to it in ‘overdrive’ when, in actual fact, there was nothing much that I could do for the people involved at that time. So, being compassionate involves empathizing, but not becoming too overinvolved or too attached. It doesn’t help them or us. Instead, we can decide to take whatever appropriate action we can when it is possible to do so when we see suffering going on in ourselves or others, and after that, we leave it as it is. I think we also need to remember to look for the Divine in these moments of our suffering to take in the bigger picture and to remember that our understanding of it all is limited. For me, a necessary part of compassion is to see ourselves as a part of that bigger picture, part of the whole, as if the whole of humanity is one organism all interconnected. We are connected so if we harm ourselves, for example by self-judgment or criticism, we are also harming others by default. I find that whenever I fall into judging myself for one thing or another I become less available to others and deprive them of the benefit of my light. We all suffer at some point and at various stages of our lives. Equally, we can all connect with true peace, love and joy. This dual nature of humankind and the world is part of what enables us to tell the difference between say, love and hate, sadness and joy, hope and despair. Wisdom and awareness arise through the ability to discriminate between these. Discernment is an essential part of the path to enlightenment and the basis for making free choices. It wasn’t until I became compassionately aware of what was happening inside of me, my patterns, triggers, pain, traumatic imprints, my interpretations of my experiences and so on that I was able to reconnect with my deeper truth and joy. Choosing to be compassionate towards ourselves involves being kind, affectionate, caring and accepting ourselves just as we are, without judgment or self-criticism and with genuine, loving inner and outer support and affection. My own healing journey from trauma began with these compassionate words spoken by my husband when I first met him: “I accept you just as you are”. It was this acceptance that allowed me the space to discover who I truly am and to let go of everything that I am not. Self-acceptance is not a justification for staying stuck … as when some may say, ‘it’s just the way I am!’, as this would continue the suffering and not alleviate it! It is a way of allowing yourself to be with your suffering, honestly and just as it is, not ignoring it, just being in awareness of it without judging yourself for being a failure or for being ‘selfish’ for giving yourself some attention. In fact, it entails the transcendence of selfishness. It is an allowance that doesn’t get caught up in immediately wanting to ‘fix it’ or trying to ‘tough it out’. 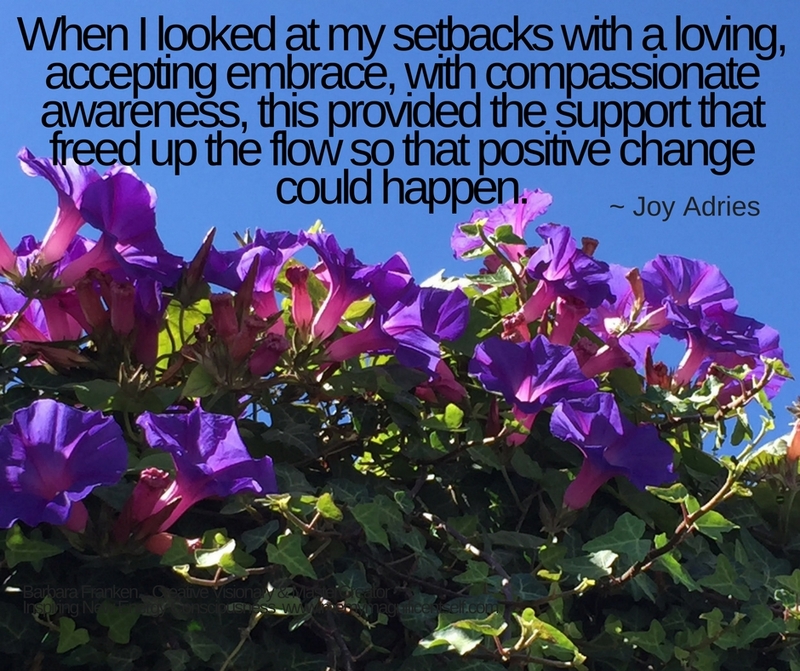 When I looked at my setbacks with a loving, accepting embrace, with compassionate awareness, this provided the support that freed up the flow so that positive change could happen. When we judge or try to assert control we stop the natural healing flow. Compassion is about looking after yourself and your true needs so that you feel complete, satisfied, fulfilled and open to growth. I found that as I developed a genuine sense of concern for my own well-being (rather than being in ‘survival mode’) this also radiated out to others. I became more open to treating them as I would wish to be treated myself and to refraining from inflicting pain. Compassion is a love-based rather than a fear-based motivation, inviting, encouraging and supporting us with true tenderness, instead of aggressively beating ourselves with a stick through feelings of lack, or not being good enough or being afraid to fail. I found a delightful curiosity and sense of adventure in it, forgiveness and reconciliation, affection and appreciation, just being there, mindfully present, willing to see the truth beyond the surface and remaining open to deeper possibilities. It is where my true being, my freedom, peace, joy and fulfillment resides. Joy Idries is an internationally recognized personal transformation expert, intuitive guide and healer. In a very gentle and loving way, she helps to clear deep emotional trauma and bring about truly deep and lasting shifts in her students that open the way to a beautiful, loving and lasting connection with the Divine. She is able to easily and skillfully facilitate deep and transformative self-surrender which gently unfolds, in an embrace of presence and compassionate awareness, into pure inner truth and awakening. Joy spent many years facing and overcoming early childhood trauma, depression and chronic illness. It led to her seeking the deeper meaning of life. Her passion now is to share the treasures, knowledge and wisdom she discovered on that journey to guide you towards the total peace, contentment and joy that can be found in surrender to love. www.liscashin.com Live Life On Purpose. Thank you so much Joy for sharing your unique joyous self and your beautiful experience of Compassion with us all here. You are a great example of how to shine our light and live a life of joy… that can only result in the co-creating of Heaven on Earth. Sharing is Caring, such a powerful way to help bring the light into more and more hearts that are opening now. I appreciate you sharing this Guest Blogger Feature with your friends and family… Thanks so much. 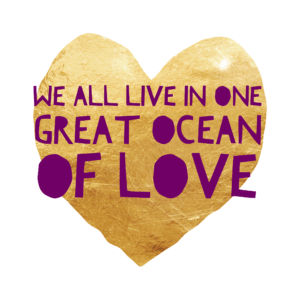 Together we can inspire and support each other and create an abundant, joyful and harmonious life. Thank you, Joy! I really enjoyed reading your piece on compassion. I think what resonated with me most was being with your pain and accepting it. Not judging yourself for it. This is something I have always had difficulty with because I was raised with the “tough it up” attitude and “others have it worse than you do” or being told I am spoiled. This carried over into me suffering such severe depression that it included psychosis when I lost two babies. After my adult son crossed over I felt that I had to be strong and “recover” as quickly as possible and do my best to help others while ignoring my immense pain. Therefore, I really appreciate you addressing this. Wise words about not over-attaching to others’ pain–lest we drown in it along with them. We can only be of help by bringing light. How are you? Just a reminder that you are up today 11/12 to post for my Sense-sational Challenge.